It was my great pleasure to present our latest Vintage member of the Millennium Club, Noel McVey, with his award for completing 2000 events since 1 January 2000. 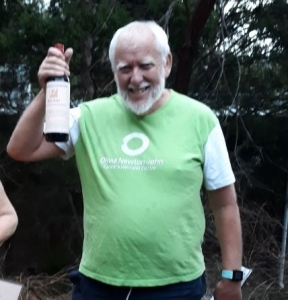 Noel joins a very select group of orienteers who have achieved this feat, and has been accompanied for many of his thousands of kilometres by the ever-cheerful Lenny, who according to Noel, is the brains behind the outfit. Noel is our Wednesday scorer – a big job which he performs with diligence and aplomb. Noel is also a dual winner of the MEFTY award, and was the course setter for last years Champs at Valley Lakes. 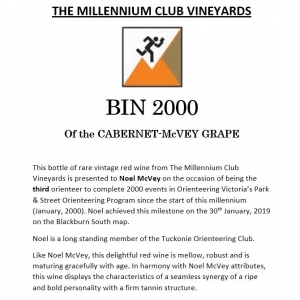 Noel received a fortifying bottle of Bin 2000 Vintage Red, labelled with his profile and milestone achievements. We salute you!